The first edition of the JK Tyre Xtreme 4Play, an offroad competition, concluded today at the Kikar Lodge in Chandigarh. The three-day event saw over 20 teams compete in two categories Xtreme 4Play for vehicles with modifications and 4x4 Play for stock vehicles. The Xtreme 4Play category, as the name suggests, is the tougher of the two classes for professional offroaders, while the 4x4 Play category was designed for amateurs. The four member team with two cars from the Bangalore Offroad Drivers Association (BODA) team driven by Siddartha Santosh and Lokesh Shivaraj, won the overall title after scoring a total of 455 points. 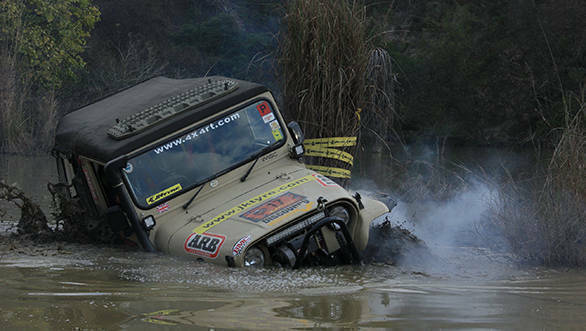 This is the second time they've won a JK offroad event, the first one being the JK 4x4 Fury event at the 2016 Orange Festival in Dambuk. Finishing second in the Xtreme 4Play category were drivers Tejinder Singh and Gurusahib Singh from Gerrari Offroaders with a total of 450 points. Vijay Kumar V and Prashant Venkappa from BODA took third with 405 points. In the 4X4 Play category, Lt Col SS Dhaliwal and his co-driver Harinder Singh Gill took first place. Naresh Sharma and Deepak Thakua finished in second place while Vijay Kumar and Pradeep Kumar took third.